For over 70 years, Hoosiers have told, re-told, printed, and re-printed a story about how basketball came to Indiana. According to the tale, Rev. Nicholas McCay (nearly always incorrectly spelled as McKay) was a protegé of James Naismith at the YMCA training school in Springfield, Massachusetts. McCay allegedly learned the new game of basketball from Naismith, and brought it with him to his first post at the Crawfordsville YMCA. 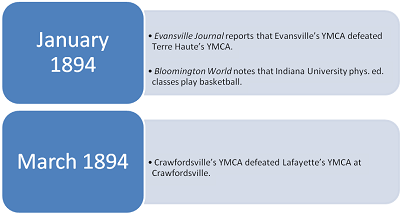 * It was there that the supposed “first” basketball game in Indiana happened on March 16, 1894 between teams from the Crawfordsville and Lafayette YMCAs. 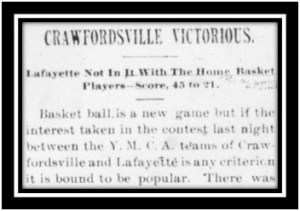 Several contemporary newspapers reported on this game, including three of Crawfordsville’s four newspapers, and brief mentions appeared in Lafayette and Indianapolis papers. Crawfordsville Daily Journal, March 17, 1894, reported on the game. Click the image to view a PDF of the entire article. There is ample evidence that a Crawfordsville-Lafayette game took place. However, was this game really the “first”? Superlatives (“oldest,” “first,” “last”) are always challenging to historically verify. In 2007, I came across the first shred of evidence to suggest that Crawfordsville’s claim was not undisputed. The evidence was an article in a November 17, 1894 issue of the Crawfordsville Review, which is shown here. Crawfordsville Review, November 17, 1894. Click on the image to view a larger picture. Notice the second sentence: “Basket ball was introduced into the State by the Indianapolis association through its physical director.” It seemed odd that a Crawfordsville paper would carry this article; especially if Crawfordsville citizens in 1894 believed that they introduced the sport to the state nine months earlier. Further research was necessary. Could this statement about Indianapolis basketball be confirmed with contemporary sources? At the time of this article’s discovery in 2007, very few historic Indiana newspapers were digitized. 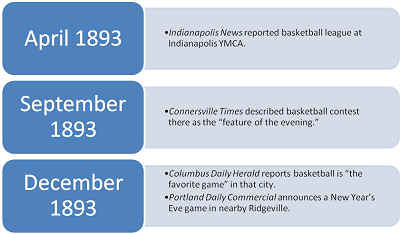 An effort to find corroborative evidence of basketball played in Indianapolis before the Crawfordsville game in March 1894 would have required many, many hours of microfilm research, probably over several weeks (if not months), to search several major Indianapolis dailies (News, Journal, Sentinel, and Sun) from 1892-1894. The time required to conduct the search forced me to delay pursuing the research. 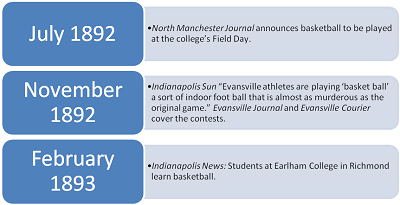 In 2013, IUPUI’s Center for Digital Scholarship digitized and uploaded a large run of the Indianapolis News. Here at last was an easy way to search for evidence to confirm what the Crawfordsville Review published in 1894. After entering the search terms, I received numerous results, which I then sorted by date. Then low-and-behold, there in black and white, tucked between an illustration of an acrobatic hound, and accounts of meetings of the State Board of Health and the Haughville Republicans, was the earliest mention of basketball being played in Indianapolis. The News published this article on March 30, 1893, which was almost an entire year before the Crawfordsville-Lafayette game occurred. Indianapolis News, March 30, 1893. The acrobatic hounds garnered more attention than the first mention of basketball played in Indy. The News gave greater attention to the new game in the April 1, 1893 issue (p. 7). They devoted an entire two columns to the sport. 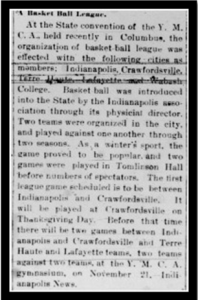 The reporter noted that basketball “has taken hold here and is awakening interest and promises to become the all-around game for general fun in the future.” The article credited Indianapolis YMCA physical director, William A. McCulloch, with introducing the game at the Indianapolis branch a few months prior. McCulloch organized a four team league at the Indianapolis Y. However, could the 1894 newspaper claim that “Basket ball was introduced into the State by the Indianapolis association” be taken at face value for being accurate regarding “firsts”? A few months after IUPUI uploaded the News, the Evansville Vanderburgh Public Library digitized millions of pages of Evansville newspapers through the commercial firm NewsBank. 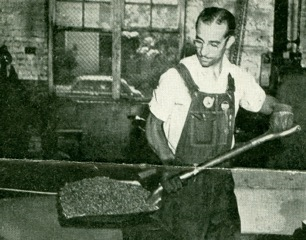 Researchers can use the resource on site at EVPL. I had also come across mentions of Evansville playing basketball earlier than the Crawfordsville-Lafayette game, so I thought this would be a prime opportunity to check this out. The search results did not disappoint. 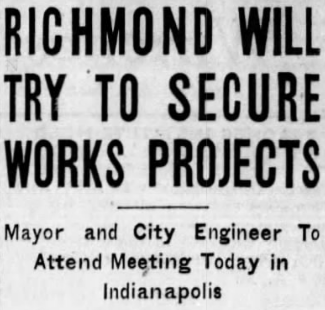 Based upon the newspapers currently digitized, Evansville was one of the earliest adopters of basketball. The Evansville Journal and the Evansville Courier both reported on contests as early as November 1892, which was less than a year after Naismith invented the game. 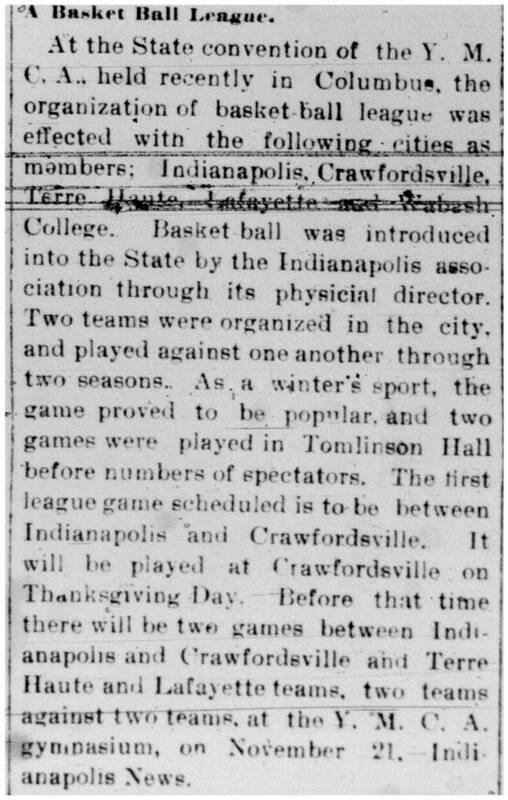 Evansville also hosted an inter-city Indiana basketball game several months before the Crawfordsville-Lafayette game. In January 1894, the Evansville YMCA squad defeated a team from the Terre Haute YMCA. It is important to remember that YMCA leaders in Indiana first learned about basketball through the Triangle, the YMCA’s national newsletter. Naismith published an article introducing the game in January 1892, and he later credited this article, and the correspondence that resulted from it, with spreading the game across the nation. By September 1892, the YMCA publication Physical Education advertised a “descriptive pamphlet” on the “new and popular game” available via mail for ten cents. Theoretically, by that time, any of Indiana’s twenty-seven YMCAs could have read Naismith’s original article or acquired the pamphlet, and subsequently implemented the game. In this context, identifying the “first” game then becomes a somewhat subjective matter, because the sport did not enter Indiana and spread from any single locus. Rather, it originated and developed around the state simultaneously and often independently at multiple YMCAs at roughly the same time. Also, what is the criteria for declaring a “first”? “First” YMCA gym class instruction of basketball? “First” practice? “First” scrimmage? “First” exhibition? “First” YMCA intramural league game? “First” intercity or inter-institutional game? The possibilities of what would constitute a “first” seem endless! If you are interested in reading more about this research, see the 2015 Thornbrough Award-winning article: S. Chandler Lighty, “James Naismith Didn’t Sleep Here: A Re-examination of Indiana Basketball’s Origins,” Indiana Magazine of History, Vol. 110, No. 4 (December 2014), pp. 307-323. You can possibly find a print copy at your local library’s local history room, otherwise you can order a copy, or download a copy from JSTOR. 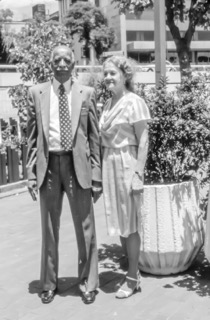 College Digital Collections, http://cdm16122.contentdm.oclc.org/cdm/ref/ collection/p15370coll1/id/146.